Earlier today, I did something that was either really stupid, or incredibly amazing — I just don’t know which. I need your help. 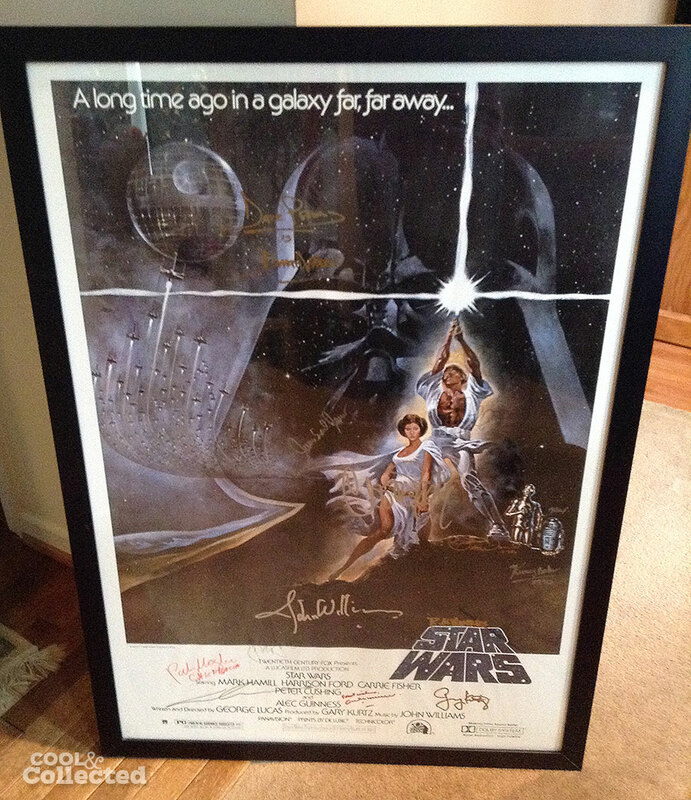 I purchased this signed Star Wars poster from “some guy.” There is no documentation and all the information I have is that this guy, let’s call him “Slipping Jimmy,” bought it at a pawn shop years ago. The red flags were flying high, but damn if I wasn’t intrigued. Jimmy and I exchanged several emails over the last week or so, and I ended up getting the poster after Jimmy agreed to lower the price quite a bit. We met in a big box store parking lot at a predetermined time, and Jimmy seemed like a nice guy — older than me, and driving a late model hybrid — he can’t possibly be a scammer right? Scammers don’t drive eco-friendly vehicles! Now that I have the poster in hand, the more I look at it, the more I’m leaning towards the possibility that the signatures might actually be legit. Help me Internet! Star Wars posters, and autograph collecting especially, are not my thing. Did I get totally hosed, or is there a chance that these signatures are authentic. The poster itself is an obvious reprint, but it wouldn’t surprise me if it was taken around to various shows and conventions to gather signatures by a fan. Forging a signature is one thing, but forging a dozen takes a bit of work. Of course, that might just be me trying to justify this purchase! The poster is in a custom frame and looks great whether the signatures are real or not, so I’ll gladly hang this in the cave. It makes a great pairing with the Hildebrandt brothers’ signed poster I picked up earlier this year. So, what do you think? Trash or treasure? If anyone out there has some pointers on how to determine the authenticity, I’d love to hear it! The Kenny Baker and Dave Prowse look good to me. I’ll have to check my Anthony Daniels when I get home. Is there a year on the poster and if so is it dated before Sir Alec passed? If they are fake, the person did a decent copy job on Anthony Daniels because without even looking at mine I can say that’s pretty darn close if it’s not real. There’s no reprint date on the poster, just the original 1977 date. The Chewie autograph doesn’t really look like the one I have hanging on my wall, which I watched him sign. I spent waaay too much time looking up each one. I have found consistent examples of each, especially compared to Celebration samples. The headshot autographs are so inconsistent because assistants do those. I’d say this is authentic in a range of 90-100% certainty. There are way too many unique strokes, quirks, pressure, zone depth, etc for this to be reasonably faked. Anyway, authenticatemyautographs dot info will give you their professional opinion for FREE… and a COA for a fee if you want that too. Thanks Steve! I’ll definitely send this in o that website and see what they think. Yes – stunning, looks great. We can issue you certification if you need it. Thank you for your email. In our opinion we would say this is definitely genuine and we would be happy to produce a certificate for you if required. Just FYI, Rare and Signed is on Ebay’s Banned COA list. I’m more interested in the authenticity of the movie posters. What are the measurements? Vintage Star Wars one sheet movie posters measure 27″x41″ now if it’s smaller than that, 27×40″ or 24×36″ obviously a reproduction. I see an NSS# on the bottom right of the “New Hope” poster. An NSS# is for the National Screen Services company, they handled all the promo at the time. The correct Star Wars NSS# is 770021, which essentially means it was the 21st movie that was released to theaters in 1977. If the NSS# has an R before the numbers, that stand for “re-release”. Which means, it’s still original theatrical release, but from the 1980’s or 1990’s etc. Also, most one sheets were folded for shipping to theaters until the 1990’s. Are there any fold lines? Some posters were kept rolled back then so it’s not an absolute, but not all of these factor in to a movie posters authenticity. 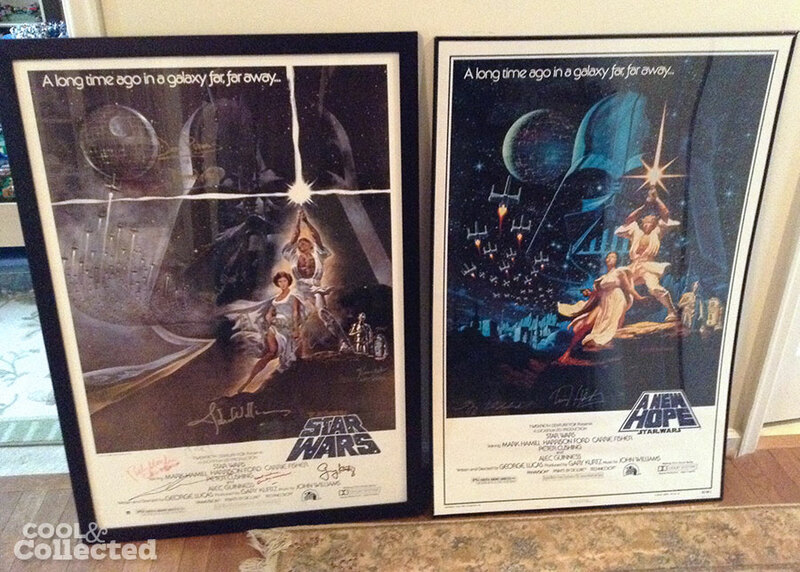 I mention this, because as a collector, A REAL collector, not the guy you bought it from, but the original owner…would NEVER mark up original Star Wars movie posters with fake signatures. If the posters are authentic, I would say those autographs are authentic too. The poster on the left has a larger frame, and I feel that the NSS# could be blocked for that one, if it has it, under the framing. I myself avoid Star Wars posters because there is SO many bootlegs and reproductions and knock offs. They’re obviously a hot item for popculture enthusiasts and sci-fi collectors. I usually tend to believe things like this are real, but as a collector I only buy from reputable dealers because the idea of having a fake would drive me insane. I like the comfort and certainty of authenticity, even though you know you pay extra for that certainty. But any collection is an investment to some degree or another, right? Likewise, I don’t think an autograph collector would pile on all those autographs con-hopping the globe, for just a reproduction poster. *I myself, have a movie poster for ‘The Warriors’ signed by Walter Hill. The signature is legit, because I got that from him myself and we had a great conversation. But the poster is a reproduction, and believe me, THAT haunts me in my sleep. Mainly because it’s not the best it could be. But I didn’t have any choice, meeting Hill was so last minute, i was lucky to grab ANY poster…and when are you ever going to get to meet Walter Hill again? Heritage Auctions sells a lot of signed Star Wars stuff, and they have an excellent database for comparing signatures and cross-referencing at Ha.com. Over all, I think your Star Wars movie poster is a good score! Thanks for the info and opinions Matt. I’m positive the poster is a reprint. The Hildebrandt poster is an authorized signed print they distributed a few years back on QVC I believe. Gonna share this post on RebelScum. The peeps there will have some good insight on it I think. I’ve got a lot of those signatures too on figures that I traveled around and got myself in person at conventions. Most of those look legit. My main concern would be the Lucas, Sir Alec and Williams autographs. Lucas RARELY signs except for charities. He’s been known to do it more in the last few years but rarely at an event where you can get a poster in to have him sign. Usually it’s smaller stuff handed to him quickly More often than not, on a multi-signature poster, it’s a fake. But that’s just my experience. I never see where John Williams is out anywhere accessible for signings. He doesn’t do the convention circuits. So, again, unless it was a charity thing, not sure how that happened. Same thing with Alec Guiness. He died in 2000, so that means this whole poster started over 15 years ago. Alec didn’t really sign anything in his later years, so maybe even earlier than that. I don’t think he did any type of convention in his later years. Maybe, sometime in the late ’90s there was a charity auction which got all of these signatures all at one time. But there is literally no way to validate that. The majority of signatures ARE readily accessible today. It’s just I question the Lucas, Williams and Guiness signatures. But I could be wrong. It’s a crapshoot with these multi signature items because unless you have photos of all the celebrities signing it, there’s literally no way to verify it. It looks great, though, Brian. I would be very wary of the Alec Guinness signature. He was notorious for not wanting anything to do with Star Wars after the movies were released. In fact, he had agreement in place that he wouldn’t have to do any promoting of the movies. So, unless the person was a good, personal friend of Sir Guinness and he lived in England I find it hard to believe that one is legit. However, the David Prowse looks legit. As far as trying to get the signatures certified, I wouldn’t bother. I have stuff that I’ve gotten personally signed in person and the supposed autograph experts won’t validate it. But I have seen stuff that I know is fake and it get certified. My advice, as long as you are happy with it and have no intention of trying to resell, then the signatures are legit. I like your attitude. 😉 Thanks for the input. I’m going to gladly hang this on the wall and pretend it’s real. 100% bad advice given here, 100% fake poster. Not even one of these signatures looks right. 100% fake. Sorry about that, hope you didn’t pay too much. Ben above is an idiot sigs all look legit. Seen so many of them a fake sticks out like a sore thumb.